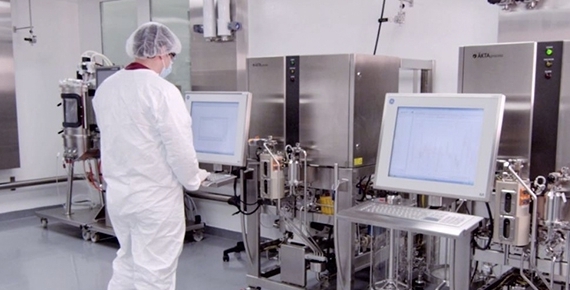 College Station, Texas-based firm G-CON Manufacturing says its mission is to revolutionize the biomanufacturing industry by providing comprehensive cGMP manufacturing solutions that are more easily scalable, more flexible, and more cost efficient to operate than any existing solution in the industry. G-CON’s combination of single-use platform technology with modular facility construction is a template for flexible manufacturing. G-CON Cleanroom & Containment PODs are flexible, modular, and mobile processing solutions for the future of biopharmaceutical processing. In contrast to traditional biomanufacturing facilities, whose shortcomings include excessive cost to build, lack of flexibility, and high expense to maintain, the G-CON POD solution is designed to be multipurpose and repurposable, as opposed to fixed and specialized with ineffective capacity utilization. A typical G-CON POD is 24′ x 42′ and is transportable to a facility site by flatbed truck in two 12′ sections .G-CON’s portable cleanroom PODs come in standard dimensions of 12′ or 18′ or 24′ wide, 42′ long and 13′ highs can accommodate most up- and downstream bioprocessing activities. The PODs can be clustered or interconnected to provide all of the necessary environments for bioprocessing and pharmaceutical manufacturing, are completely self-contained, have redundant air handling systems and can be quick-connected to centralized chilled water and electricity. This means that also conventional construction can be re-used, by introducing PODs into the emptied space. PODs can also provide superior flexibility for multi-product or patient specific manufacturing, as the systems can be easily decontaminated with vaporized hydrogen peroxide (VHP). the ability to capitalize on market opportunities sooner. • Projects delivered at up to 45% lower cost than traditionally possible. • Simplified design process due to unnecessary superstructure. • Rapid commissioning due to external POD build. • Enhanced manufacturing flexibility and capacity scalability. • Lower facility operating costs than in conventional methods. • Multi-product or unit operation utilization as PODs can be easily decontaminated. PODs are delivered fully commissioned with a compliant engineering turnover package. All PODs come equipped with air bearings for for easy movement and are easily retrofitted providing the ability to perform over many use cycles, thus easily re-commissioned for a different project. Their all-aluminum construction resists corrosion over their 15 year designed operating life. 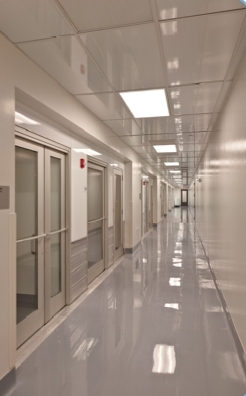 Materials of construction are consistent for use with and resistant to the major disinfectants and decontamination systems including vapor-phase hydrogen peroxide (VHP) decontamination, allowing for quick turnover between campaigns and quick decontamination in the event of a containment issue. 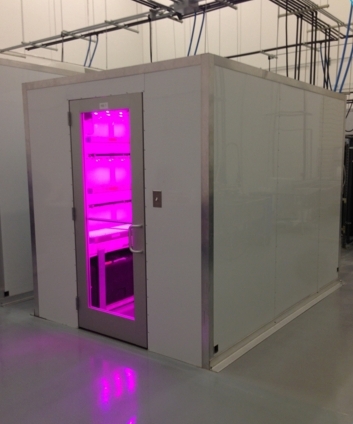 PODs are self-contained and self sufficient and capable of a broad range of air qualities and BSLs, which is a high priority for stem cell laboratories, and can also be configured to re-utilize conditioned air from the clean space for enhanced energy efficiency. HVAC is fully redundant with automatic failover for continuous worry-free use, with Rockwell Control Logix control PLCs plus a 14-port switch for direct interface of process equipment and HVAC data output. PODs recapture and reuse heated and cooled air from the host facility. PODs’ on board Kidde FM 200 fire suppression systems are standard equipment and not only suppress fires, but communicate with any BMS. Zero drip quick connects are provided for connection to water and electricity, that allow for connection in minutes, with standard CGMP process piping included and no additional wiring is needed. Poured epoxy floors are standard in PODs. Floors are monolithic, slip resistant, and easy and decontaminate. Floors are often an overlooked additional cost and gating factor in stick build and other modular products. The next generation of biotechnology and life sciences research is going to require a lean, flexible, cost-effective approach to lab construction. This is particularly true in the burgeoning Texas biotech sector, where the industry is growing so quickly — through bold, new initiatives, such as the recent Federally funded vaccine production project that Texas A&M and GlaxoSmithKline is conducting, as well as a wealth of new biotech startups that need to get up and running as quickly as possible while keeping costs down. 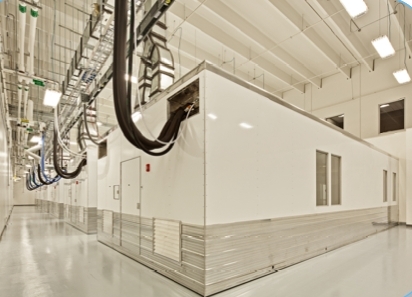 G-Con’s Cleanroom PODs offer a compelling solution for these specific needs, since they can be designed, built, supplied and commissioned much faster than conventional facilities at significantly lower cost with unmatched manufacturing flexibility and the assurance of a commissioned environment. Cost savings on total projects have been found to be greater than 30% for the pod-based design, with the largest savings found in HVAC costs, utilities distribution costs, and superstructure costs. To a biopharmaceutical manufacturer this means reduced risk, lower capital investment, lower cost to operate, and a shorter time to market. multi-tiered, easily transportable and customizable to meet specific needs. • Fertigation and Acid Injection Systems . Dr. Barry Holtz, Chief Science and Technology Officer of G-Con, LLC, is a recognized international expert in design and construction of biotherapeutic facilities. His 30 years of experience in the biopharmaceutical industry provide the basis for his abilities in the design of facilities in any venue. Such experience is most evident in his role as a founder of G-Con and the groundbreaking flexible GMP manufacturing POD technology. G-Con, LLC Chief Operating Officer Maik W. Jornitz is a distinguished technical expert with over 25 years of experience in sterilizing grade filtration and single-use technologies within the biopharmaceutical industry, including regulatory requirements, integrity testing, systems design, and optimization. Jornitz is a world-wide supporter of the biopharmaceutical industry, currently serving as a member of the PDA Board of Directors (Immediate Past Chair) and Science Advisory Board (SAB). Charles Moore is a syndicated columnist for several major Canadian print newspapers and has an extensive background in covering technology. He serves as a Contributing Science and Technology Editor for BioNews Texas. BioNewx-TX is the only digital publication dedicated to providing comprehensive coverage of BioNews in Texas.